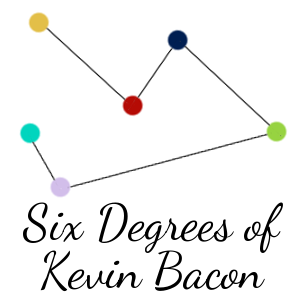 This is the party game, The Six Degrees of Kevin Bacon, in blog form. The post is laid out starting with one actor, often one with a new TV series, season, or new movie coming out, who then is connected to Kevin Bacon within six degrees of separation based on a progressive chain of films connecting one actor (one degree of separation) to the next. To make it more challenging, I like to use only movies I have actually seen as connections, and I try not to re-use connections, people or films, too often, but that's not always possible. It's a lot of fun, and it's a unique feature I'm proud to have here on the blog, so check out the posts and see if you can beat my score!